Generally speaking, a heating mantle is referred to as a device which is used in laboratories to heat or temper certain media in glass vessels. Due to the various sizes of the glass vessels, the exact amounts of liquids which are necessary can be heated. The scope of volumes of a heating mantle at PCE ranges from 100 ml up to 10 liters. This ensures that every customer can get exactly the product that suits their individual requirements. A heating mantle is used in laboratories for the exact preparation of samples and thus, it is very important that these devices have a high level of functionality and accuracy. A typical heating mantle from PCE works with a round-bottom flask which is inserted into a basket made of woven fabric. Inside that round-bottom flask, there is the liquid to be heated or tempered by means of the heating elements which are located in the heating mantle. PCE’s heating mantle portfolio comprises different sizes of the heating mantle itself and of the round-bottom flask like, for example, 1,000 or 5,000 ml, and the devices can reach different temperatures and have various levels of temperature regulation. Temperatures of up to +450 °C (842 °F) are possible. 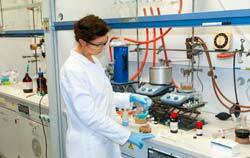 The heat-up time is very short which enables laboratory professionals to start their work soon. Another advantage of using a heating mantle is that the heat is distributed very evenly, which means that the danger of hotspots on the flask is eliminated. Also, no condensed water will be created when using a heating mantle. In comparison to other tempering equipment like hot plates, Bunsen burners or water baths, a heating mantle are suitable for organic liquids which can sometimes inflame when using other equipment. A heating mantle is very easy to use but a short instruction manual is included in the delivery. The heating mantle PCE-HM 100 is used in applications where samples or liquids must be quickly heated in the laboratory. The flask may have a volume of up to 100 ml and it is placed in the crocheted net of the heating mantle. Here it is heated by the heating elements with a power of 100 W, and the temperature can be continuously adjusted up to 450 °C using the rotary switch on the heating mantle. The heating mantle PCE-HM 250 is an auxiliary device, which is used in laboratories. The heating mantle helps to heat or control the temperature of different samples or chemicals in the laboratory. The device has a crocheted net inside, in which you can hang the round bottom flask to heat it. 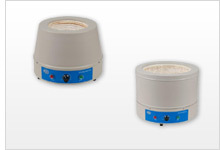 The heating mantle PCE-HM 500 is an auxiliary device, which is used in laboratories. The heating mantle helps to heat or control the temperature of different samples or chemicals in the laboratory. The device has a crocheted net inside, in which you can hang the round bottom flask to heat it. The heating mantle PCE-HM 1000 is an auxiliary device, which is used in laboratories. The heating mantle helps to heat or control the temperature of different samples or chemicals in the laboratory. The device has a crocheted net inside, in which you can hang the round bottom flask to heat it. The heating mantle PCE-HM 2000 is used in applications where samples or liquids must be quickly heated in the laboratory. The flask may have a volume of up to 2 liters and it is placed in the crocheted net of the heating mantle. Here it is heated by the heating elements with a power of 450 W, and the temperature can be continuously adjusted up to 450 °C using the rotary switch on the heating mantle. The heating mantle PCE-HM 5000 is used in applications where samples or liquids must be quickly heated in the laboratory. The flask may have a volume of up to 5 liters and it is placed in the crocheted net of the heating mantle. Here it is heated by the heating elements with a power of 800 W, and the temperature can be continuously adjusted up to 450 °C using the rotary switch on the heating mantle. The heating mantle PCE-HM 10000 is used in applications where samples or liquids must be quickly heated in the laboratory. The flask may have a volume of up to 10 liters and it is placed in the crocheted net of the heating mantle. Here it is heated by the heating elements with a power of 1200 W, and the temperature can be continuously adjusted up to 450 °C using the rotary switch on the heating mantle. A heating mantle is used in the laboratory for the heating of round bottom flasks and their contents. The round-bottomed flasks are filled and heated. The PCE-HMA series is available in different sizes. The heating mantle is controlled by a slider. All models of the series are equipped with RCD protection. - Diameter of round-bottomed flask: 41 - 345 mm / 1.6 - 13.6"
More Information It is hardly possible to imagine any laboratory researches and inventions without the materials and substances being heated in the process of studying and experimentation. It is one of the important and even compulsory steps, since the heated-up materials are more active, evaporate quicker and react to the presence of indicators better. So, the importance of application of such a device as a heating mantle should not be understated. 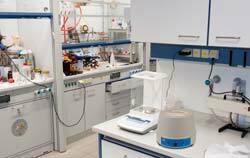 In addition, many samples used in the laboratory are often flammable or contain organic substances which may be explosive when treated without precaution. Heating mantle has been designed in such a way so that to make the process safe and facilitate the heating of absolutely different substances. Not only substances but also containers, in which they are placed, vary. Laboratory vessels may have different shape and size and one of the advantages of the heating mantle is that it has been designed in different versions, in order to make it possible to heat-up absolutely various containers. The heating mantles in fabric are quite flexible and even the most “challenging” shaped flasks can fit perfectly well, without being broken, and the content will be heated-up uniformly.